Kendo footwork is ashi-sabaki in Japanese. There are 5 ashi-sabaki in kendo. Where do you think your feet should be? In the basics, the right foot is the front foot and the left foot is the back foot. And lift the left heel slightly up. Suri-ashi is the way we perform all the other kendo footwork. It is a sliding movement. In kendo, we, most of the time, slide/glide. First, we have to acquire the sliding movement. In the basic stance, chudan, our right foot is the front foot and the left foot is the back foot and the left heel is slightly lifted up. However, when we move, it is much easier to lift the both heels up slightly. How slightly do we have to lift our heels up? Slightly enough to put a piece of paper between your heels and the floor. We probably should lift the left heel higher than the right heel since we eventually jump forwards a lot. This is the most important kendo footwork or ashi-sabaki . It is also the most difficult one. Without this, you cannot do kendo. When we want to go forwards, we move the front foot first. When we go backwards, we move the back foot first. 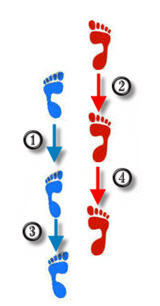 So in the basics, we move the right foot to move forwards and the left foot to move backwards. In okuri-ashi, the back foot never passes the front foot. It doesn't matter if the right foot is the back foot or the left foot is the back foot. The back foot cannot pass the front foot and vice versa. * It is very common that the beginners drag their feet, specially the back foot, when they perform this ashi-sabaki. No dragging in kendo footwork. Never! This is okuri-ashi going forwards and backwards. Zenshin is "going forwards" and kotai is "going backwards". You will hear this word, Zenshin Kotai, all the time. Repeat 2 and 3 until a commander shouts "Yame (Stop)". When the practitioners get used to the ashi-sabaki, the commander does not have to say "Mae" and "Ato". The practitioners keep moving and shouting until the commander shouts "Yame". In this exercise, we take a step forwards on a command of "Mae" that means "forwards" in this case. We take a step backwards on a command of "Ato" meaning "backwards". The practitioners shout "EI!" when taking a step forwards and "YEAH!" when taking a step backwards. We practice this without a shinai first to get used to the movement. Then grab a shinai and perform this exercise. Niho means two steps. In this exercise, when we hear "Niho Zenshin Niho Kotai Okuri-ashi", we take two steps forwards and backwards. 1. Niho Zenshin Niho Kotai Okuri-ashi, Hajime! In this exercise, we take two steps forwards on a command of "Mae, Mae" and two steps backwards on a command of "Ato, Ato". The practitioners shout "EI!, EI!" when taking two steps forwards and "YEAH!, YEAH!" when taking two steps backwards. 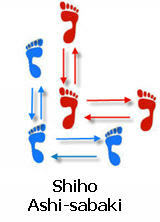 Shiho means four directions. On this command, we take a step forwards, backwards, to the right and to the left respectively. Before we learn this, we should breifly practice okuri-ashi to the right and left. We do not have to take much time on this ashi-sabaki. Then move onto Shiho ashi-sabaki. Repeat 2 and 5 until a commander shouts "Yame (Stop)". When the practitioners get used to the ashi-sabaki, the commander does not have to say "Mae", "Ato", "Migi" and "Hidari". The practitioners keep moving and shouting until the commander shouts "Yame". In this exercise, we take a step forwards on a command of "Mae", a step backwards on a command of "Ato", a step to the right on a command of "Migi" and a step to the left on a command of "Hidari". The practitioners shout "EI!" when taking a step forwards, "YEAH!" when taking a step backwards, "EI!" when taking a step to the right, and "YEAH!" when taking a step to the left. This ashi-sabaki is an advanced ashi-sabaki. Unlike tsugi-ashi and ayumi-ashi, this is included in a basic suburi (empty cut) exercise so this is introduced at the fairly early stage. This ashi-sabaki is to change the body direction by pivoting on one foot. It should be acquired slowly but definitely as one improves his/her kendo skills. 1. From the basic stance, take a step diagonally onto the right foot followed by the left foot. 2. Move to the left diagonally onto the left foot followed by the right foot. But the right foot becomes the back foot. 3. Go to the right as in 1. 4. Repeat 2. and 3. until you hear yame. This kendo footwork will be combined with suburi later. We do not have to practice this independently with a command and kiai. From here below, we do not learn this at the very beginning. These are introduced here for your future benefit. Do not practice them at the very beginning. This is an advanced ashi-sabaki. We do not have to learn this ashi-sabaki until we get at least shodan. In the basic kendo footwork (okuri-ashi), the front foot must move first. 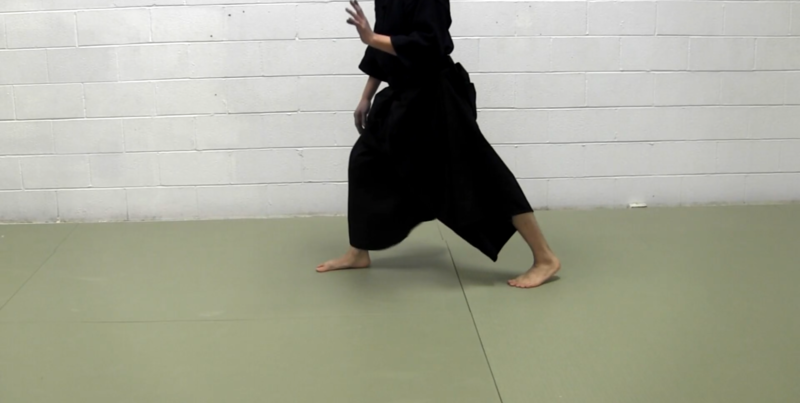 But in this kendo footwork, tsugi-ashi, the back foot moves first and it stops before it passes the front foot. If the back foot passes the front foot, it is called ayumi-ashi, which is described below. In ayumi-ashi, we can actually cross our feet like we are walking, but in suri-ashi (sliding). It is a walking with but sliding. You can watch kedno footwork videos below. 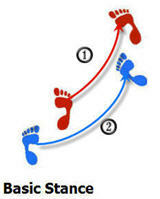 Footwork Tips: See the Big Picture: This article gives you some tips on ashi-sabaki. It is worth to know how we should learn ashi-sabaki especially in adulthood. Footwork Advice: One Thing to Remember: This article explains one very important thing to remember when we learn footwork (ashi-sabaki). If you forget this, you will never improve your ashi-sabaki. 5 Tips to Make Your Footwork Smoother: If you want to make your footwork smoother, this article may help you with it. 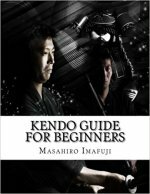 A Kendo Instruction Book Written By A Japanese For Non-Japanese Speakers Who Are Enthusiastic to Learn Kendo. Kindle version is available too. Click here to learn more about the book.